With appearances on comedy shows, books in the best-seller lists and the unforgettable image of a brilliant mind in an ailing body, Stephen Hawking has earned the title of the world's most famous scientist. His field has never been easy for a wider public to grasp: everything from the formation of the universe to those strange but dangerous features known as black holes. But his energy and humour, and his determination to reach a wider audience, have always produced an enthusiastic response. And that inevitably brings a lot of questions that people might find embarrassing to ask in public. So, as a guide for the interested but perplexed, I have added a few notes (in italics below) to the transcript of the first of Stephen Hawking's BBC Reith Lectures. I'll be doing the same thing for his second lecture next week. You can listen to the lecture live on BBC Radio 4 from 0900 GMT. After broadcast you can listen on demand or download it for later. More information on both lectures and Stephen Hawking can be found on the Radio 4 Reith Lectures site. My talk is on black holes. It is said that fact is sometimes stranger than fiction, and nowhere is that more true than in the case of black holes. Black holes are stranger than anything dreamed up by science fiction writers, but they are firmly matters of science fact. The scientific community was slow to realize that massive stars could collapse in on themselves, under their own gravity, and how the object left behind would behave. Albert Einstein even wrote a paper in 1939, claiming stars could not collapse under gravity, because matter could not be compressed beyond a certain point. Many scientists shared Einstein's gut feeling. The principal exception was the American scientist John Wheeler, who in many ways is the hero of the black hole story. In his work in the 1950s and '60s, he emphasized that many stars would eventually collapse, and the problems that posed for theoretical physics. He also foresaw many of the properties of the objects which collapsed stars become, that is, black holes. DS: The phrase 'black hole' is simple enough but it's hard to imagine one out there in space. Think of a giant drain with water spiralling down into it. Once anything slips over the edge or 'event horizon', there is no return. Because black holes are so powerful, even light gets sucked in so we can't actually see them. But scientists know they exist because they rip apart stars and gas clouds that get too close to them. During most of the life of a normal star, over many billions of years, it will support itself against its own gravity, by thermal pressure, caused by nuclear processes, which convert hydrogen into helium. DS: NASA describes stars as rather like pressure-cookers. The explosive force of nuclear fusion inside them creates outward pressure which is constrained by gravity pulling everything inwards. Eventually, however, the star will exhaust its nuclear fuel. The star will contract. In some cases, it may be able to support itself as a white dwarf star. However Subrahmanyan Chandrasekhar showed in 1930, that the maximum mass of a white dwarf star is about 1.4 times that of the Sun. A similar maximum mass was calculated by Soviet physicist, Lev Landau, for a star made entirely of neutrons. DS: White dwarfs and neutron stars have exhausted their fuel so they have shrunk to become some of the densest objects in the universe. Most interesting to Stephen Hawking is what happens when the very biggest stars collapse in on themselves. What would be the fate of those countless stars, with greater mass than a white dwarf or neutron star, when they had exhausted nuclear fuel? The problem was investigated by Robert Oppenheimer, of later atom bomb fame. In a couple of papers in 1939, with George Volkoff and Hartland Snyder, he showed that such a star could not be supported by pressure. And that if one neglected pressure, a uniform spherically systematic symmetric star would contract to a single point of infinite density. Such a point is called a singularity. DS: A singularity is what you end up with when a giant star is compressed to an unimaginably small point. This concept has been a defining theme in Stephen Hawking's career. It refers to the end of a star but also something more fundamental: that a singularity was the starting-point for the formation of the entire universe. It was Hawking's mathematical work on this that earned him global recognition. All our theories of space are formulated on the assumption that spacetime is smooth and nearly flat, so they break down at the singularity, where the curvature of space-time is infinite. In fact, it marks the end of time itself. That is what Einstein found so objectionable. DS: Einstein's Theory of General Relativity says that objects distort the spacetime around them. Picture a bowling-ball lying on a trampoline, changing the shape of the material and causing smaller objects to slide towards it. This is how the effect of gravity is explained. But if the curves in spacetime become deeper and deeper, and eventually infinite, the usual rules of space and time no longer apply. Most scientists, including Robert Oppenheimer, switched their attention to nuclear physics, and the issue of gravitational collapse was largely forgotten. Interest in the subject revived with the discovery of distant objects, called quasars. DS: Quasars are the brightest objects in the universe, and possibly the most distant detected so far. The name is short for 'quasi-stellar radio sources' and they are believed to be discs of matter swirling around black holes. The first quasar, 3C273, was discovered in 1963. Many other quasars were soon discovered. They were bright, despite being at great distances. Nuclear processes could not account for their energy output, because they release only a percent fraction of their rest mass as pure energy. The only alternative was gravitational energy, released by gravitational collapse. Gravitational collapses of stars were re-discovered. It was clear that a uniform spherical star would contract to a point of infinite density, a singularity. The Einstein equations can't be defined at a singularity. This means at this point of infinite density, one can't predict the future. This implies something strange could happen whenever a star collapsed. We wouldn't be affected by the breakdown of prediction, if the singularities are not naked, that is, they are not shielded from the outside. DS: A 'naked' singularity is a theoretical scenario in which a star collapses but an event horizon does not form around it - so the singularity would be visible. When John Wheeler introduced the term black hole in 1967, it replaced the earlier name, frozen star. Wheeler's coinage emphasized that the remnants of collapsed stars are of interest in their own right, independently of how they were formed. The new name caught on quickly. It suggested something dark and mysterious, But the French, being French, saw a more risque meaning. For years, they resisted the name trou noir, claiming it was obscene. But that was a bit like trying to stand against Le Week-end, and other Franglais. In the end, they had to give in. Who can resist a name that is such a winner? From the outside, you can't tell what is inside a black hole. You can throw television sets, diamond rings, or even your worst enemies into a black hole, and all the black hole will remember is the total mass, and the state of rotation. John Wheeler is known for expressing this principle as "a black hole has no hair". To the French, this just confirmed their suspicions. A black hole has a boundary, called the event horizon. It is where gravity is just strong enough to drag light back, and prevent it escaping. Because nothing can travel faster than light, everything else will get dragged back also. Falling through the event horizon is a bit like going over Niagara Falls in a canoe. If you are above the falls, you can get away if you paddle fast enough, but once you are over the edge, you are lost. There's no way back. As you get nearer the falls, the current gets faster. This means it pulls harder on the front of the canoe than the back. There's a danger that the canoe will be pulled apart. It is the same with black holes. If you fall towards a black hole feet first, gravity will pull harder on your feet than your head, because they are nearer the black hole. The result is you will be stretched out longwise, and squashed in sideways. If the black hole has a mass of a few times our sun you would be torn apart, and made into spaghetti before you reached the horizon. However, if you fell into a much larger black hole, with a mass of a million times the sun, you would reach the horizon without difficulty. So, if you want to explore the inside of a black hole, make sure you choose a big one. There is a black hole with a mass of about four million times that of the sun, at the centre of our Milky Way galaxy. DS: Scientists believe that there are huge black holes at the centre of virtually all galaxies - a remarkable thought, given how recently these features were confirmed in the first place. Other scientists who have given Reith Lectures include Robert Oppenheimer, Martin Rees and Bernard Lovell. You can listen to them here. Although you wouldn't notice anything particular as you fell into a black hole, someone watching you from a distance would never see you cross the event horizon. Instead, you would appear to slow down, and hover just outside. Your image would get dimmer and dimmer, and redder and redder, until you were effectively lost from sight. As far as the outside world is concerned, you would be lost for ever. There was a dramatic advance in our understanding of these mysterious phenomena with a mathematical discovery in 1970. This was that the surface area of the event horizon, the boundary of a black hole, has the property that it always increases when additional matter or radiation falls into the black hole. These properties suggest that there is a resemblance between the area of the event horizon of a black hole, and conventional Newtonian physics, specifically the concept of entropy in thermodynamics. Entropy can be regarded as a measure of the disorder of a system, or equivalently, as a lack of knowledge of its precise state. The famous second law of thermodynamics says that entropy always increases with time. This discovery was the first hint of this crucial connection. DS: Entropy means the tendency for anything that has order to become more disordered as time passes - so, for example, bricks neatly stacked to form a wall (low entropy) will eventually end up in an untidy heap of dust (high entropy). And this process is described by the second law of thermodynamics. Although there is clearly a similarity between entropy and the area of the event horizon, it was not obvious to us how the area could be identified as the entropy of a black hole itself. What would be meant by the entropy of a black hole? The crucial suggestion was made in 1972 by Jacob Bekenstein, who was a graduate student at Princeton University, and then at the Hebrew University of Jerusalem. It goes like this. When a black hole is created by gravitational collapse, it rapidly settles down to a stationary state, which is characterized by only three parameters: the mass, the angular momentum, and the electric charge. Apart from these three properties, the black hole preserves no other details of the object that collapsed. His theorem has implications for information, in the cosmologist's sense of information: the idea that every particle and every force in the universe has an implicit answer to a yes-no question. DS: Information, in this context, means all the details of every particle and force associated with an object. And the more disordered something is - the higher its entropy - the more information is needed to describe it. As the physicist and broadcaster Jim Al-Khalili puts it, a well-shuffled pack of cards has higher entropy and therefore needs far more explanation, or information, than an unshuffled one. The theorem implies that a large amount of information is lost in a gravitational collapse. For example, the final black-hole state is independent of whether the body that collapsed was composed of matter or antimatter, or whether it was spherical or highly irregular in shape. In other words, a black hole of a given mass, angular momentum and electric charge, could have been formed by the collapse of any one of a large number of different configurations of matter. So what appears to be the same black hole could be formed by the collapse of a large number of different types of star. Indeed, if quantum effects are neglected, the number of configurations would be infinite, since the black hole could have been formed by the collapse of a cloud of an indefinitely large number of particles, of indefinitely low mass. But could the number of configurations really be infinite? The uncertainty principle of quantum mechanics implies that only particles with a wavelength smaller than that of the black hole itself could form a black hole. That means the wavelength would be limited: it could not be infinite. DS: The uncertainty principle, conceived by the famous German physicist Werner Heisenberg, describes how we can never locate or predict the precise position of the smallest particles. So, at what is called the quantum scale, there is a fuzziness in nature, very unlike the more ordered universe described by Isaac Newton. It therefore appears that the number of configurations that could form a black hole of a given mass, angular momentum and electric charge, although very large, may also be finite. Jacob Bekenstein suggested that from this finite number, one could interpret the entropy of a black hole. This would be a measure of the amount of information that was irretrievably lost during the collapse when a black hole was created. The apparently fatal flaw in Bekenstein's suggestion was that if a black hole has a finite entropy that is proportional to the area of its event horizon, it also ought to have a finite temperature, which would be proportional to its surface gravity. This would imply that a black hole could be in equilibrium with thermal radiation, at some temperature other than zero. Yet according to classical concepts, no such equilibrium is possible, since the black hole would absorb any thermal radiation that fell on it, but by definition would not be able to emit anything in return. It cannot emit anything. It cannot emit heat. DS: If information is lost, which is apparently what is happening in a black hole, there should be some release of energy - but that flies in the face of the theory that nothing comes out of black holes. This is a paradox. And it's one which I am going to return to in my next lecture, when I'll be exploring how black holes challenge the most basic principle about the predictability of the universe, and the certainty of history, and asking what would happen if you ever got sucked into one. Thank you. 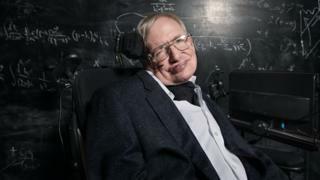 DS: So Stephen Hawking has taken us on a scientific journey from Einstein's claim that stars could not collapse to the acceptance of the reality of black holes to a collision of theories over how these weird features exist and function. And the second lecture brings us up to date with the latest thinking on black holes, and asks us to change the way we think of them. You can download a transcript of this lecture with annotations, which also includes questions to Stephen Hawking from the audience.